Like most common names, "Early Black Quill" can refer to more than one taxon. They're previewed below, along with 3 specimens. For more detail click through to the scientific names. These are sometimes called Early Black Quills. These are very rarely called Early Black Quills. 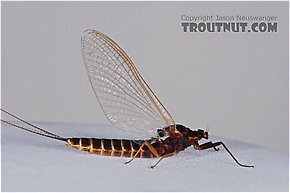 Leptophlebia mayflies do not generate superhatches, but their medium-large size and other properties make them a relevant part of the early season. 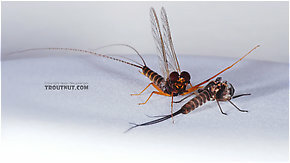 The information below was mostly discovered in Leptophlebia cupida, the most important species, but it is not known to differ in the others. Male Leptophlebia cupida (Black Quill) Mayfly Dun View 6 PicturesThis Leptophlebia cupida dun was extremely cooperative, and it molted into a spinner for me in front of the camera. 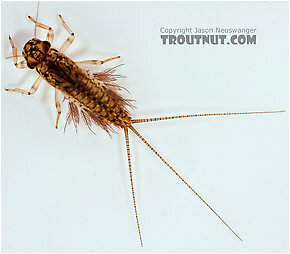 Here I have a few dun pictures and one spinner picture, and I've put the entire molting sequence in an article.